Craig Romney: My Dad Cheats And "That's What We Need in the White House." In January 2012, Mitt and Craig Romney did a small rally in Plymouth, Iowa. At that rally, Mitt Romney admitted he tripped his daughter-in-law, who had just given birth, in order to win a family race. "CRAIG ROMNEY: ...And it was down to my wife and my dad over here. 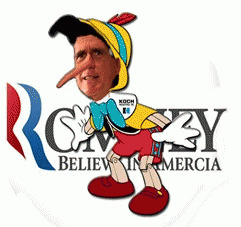 "CRAIG ROMNEY: And it was kind of in the home stretch in the run there. And she had a slight lead on him. And he said that in that moment, he decided he was going to win that race or he was going to die trying. And you see this fight to the finish, and he went for this -- he gave it everything he had. He gave it a good kick and he beat her in the end. And he did almost die trying, by the way. "He passed out in a lawn chair and we didn't see him the rest of the day. He barely made lot of life. But it's that type of hard work, it's that type of determination, I think, that we need in the White House." That's nice, an old man trips his own daughter-in-law to win a foot race ... hmmm ... well, at least he didn't impersonate a cop this time like he did when he was in college. Was Mitt "kidding" when he volunteered on stage that he tripped his daughter-in-law in a foot race to win? hmm ... I seem to recall the family laughed when the story first broke of Mitt driving 12 hours with a dog on the roof of his car ... then they stopped laughing. But, in their defense, Ann Romney has told us that the dog loved being placed on the roof for 12 hours. In June 2012, the right-wing blog Daily Caller wrote that Mitt Romney would often impersonate police and pull drivers over. "Republican presidential candidate Mitt Romney was once quite the prankster. Apparently he was also somewhat of a felon. "Reporter Joe Conason writes in an article published by The National Memo that Romney routinely impersonated police officers by sporting a cop uniform that he owned. Romney would show off his uniform, apparently a gift from his father, to friends. "'He also had a red flashing light that he would attach to the top of his white Rambler,' Madden said. "'We thought it was all pretty weird,' recalled Madden's wife, who also attended Stanford University with Romney. "'We all thought, 'Wow, that's pretty creepy.'" Buzzfeed reports that Romney's Hispanic Steering Committee Chairman Rudy Fernandez coordinated the Univsion Hispanic Forum in a way that allowed Mitt Romney to "cheat" and break the rules that both the Romney Campaign and Obama Campaign had agreed to.